Tenon saw, or frame/bow saw? I would like a tenon saw more appropriate to large joints than my little 22 tpi dovetail saw. Or, would a frame saw be a better choice? I am making a bench with 3×5.5” legs and rails. I want to be able to comfortably cut tenons in those pieces. As always, I am looking for bank-for-the-buck, honest user tools, not showpieces. If you want bang for your buck, why buy a new tool? Why not just cut then tenons in the table saw and call it a day? 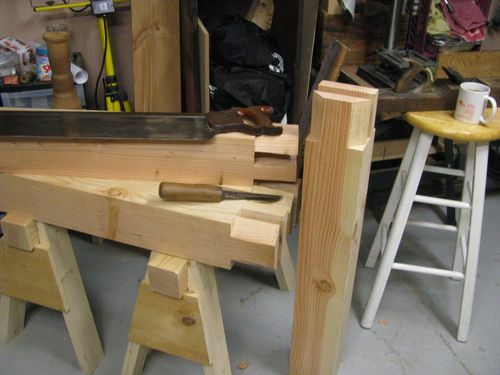 Tenon saw, or even a mitrebox saw, would be a reasonable addition to the saw till. More control on tenon cuts vs. bowsaw, IMO. Big tenon saw but Smitty’s right on with the mitre box saw. Clean the waste with a big mortis chisel. 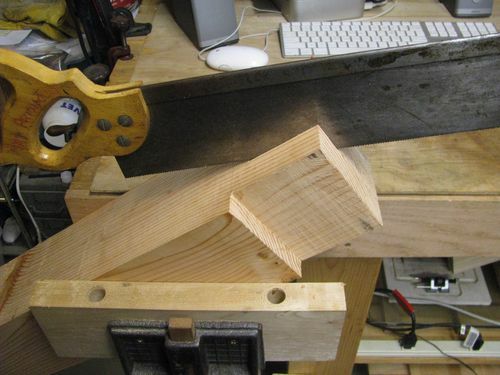 Frame saw would be more appropriate than bow, tenon would be first choice, or you could crosscut and chop out with a chisel. 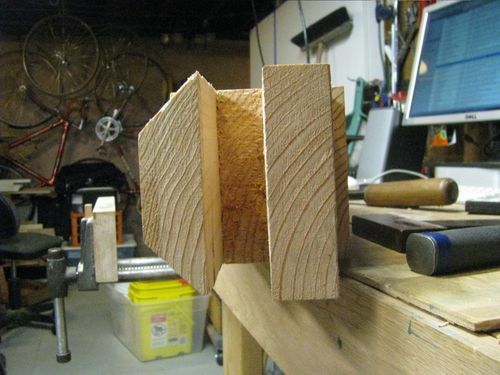 @ed13, cutting a tenon on a 3” x 5” bench leg, for example. Tony, swayed by Tage Frid’s book, I bought a frame saw early on. I’m sure others can use them, but I find it awkward and unbalanced. Once it is placed on the line and in the cut I guess it is okay, but I just find I have much more control with a tenon saw. You won’t always be building stuff this size, so as long as the plate reaches deep enough, I’d cut the tenons with a tenon saw. I find a 14”, 12 tpi, with a fine set and filed rip does all my joinery, including dovetails and tenons. For the big tenons you need to do, I’d bet you could do them with a handsaw or panel saw and then clean up with chisel and router plane. You’ll need that cleanup anyway. If the wood is straight grained, like oak, you don’t even need to saw the tenons. Cross cut the shoulders and then split the tenons. There are tricks for splitting so that you read the grain as you go to watch for the cut diving past your line. Lots of options. Getting correct tension on a frame saw is sometimes (or usually?) tricky, and as you have to release the tension after each use, there is no ‘set it and forget it” with them. It seems the narrower the blade, the more trouble one has keeping them heading in the desired direction. They are pretty neat when they work, though. ok, upon reading the opinions above, a tenon saw sounds like a good choice. God help us all, but do we have preferred brands and models?